Belinda hails from St. Helena, one of the most remote islands in the world located in the South Atlantic Ocean between South America and South Africa. As a child, she has always loved the waters and the ocean. When she turned 17, she started working on RMS St. Helena, a small cargo ship that transports vital supplies from the African coast to their island. However, her life aboard the ship wasn't easy. During her training as a cadet, her chief officers made it difficult for her. She was forced to work longer and do more tasks. But she didn't give up. She then took her chance on the yachting industry. But a few years later, she realized it wasn't for her, especially when an agent from Antibes, France told her that it would be hard for her to find a job in that industry because she had a higher education than most captains at that time, she is a woman, and she is Black. She eventually made her way up the ranks on the ship she has been working on for the past 14 years, The MSY Wind Star. She was initially a second officer until she became a chief officer. 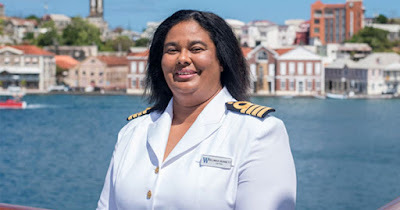 In January 2016, she became the captain of the four-masted ship that accommodates 148 guests and 101 crew and sails through the Carribean in winter and Europe in summer. "I had goals in life, which I've succeeded at, and I'm a very strong woman. Being a woman, you have to work extra hard to prove yourself -- even more than a man. Some men might not like that, but that's the way it is. I'm driven. I wanted to be captain, and so, I am," Belinda said in an interview with Forbes. Even though the cruise industry is becoming more accepting of women in recent years, women still only comprise 5.4% of its upper officers worldwide. Belinda, who was recently awarded the U.K.'s prestigious Merchant Navy Medal for Meritorious Service, hopes her experience could encourage other women to work at the sea as well.